There are some basic necessities of pet care that all pet owners need to take into consideration. In order to have a healthy and happy pet, there are certain things that need to be provided to our beloved animals– especially dogs. Pets first and foremost need food and water. They cannot live without these things. Ideally, pet owners need to feed their dogs food that will meet their nutritional needs. With that in mind, there are certain dog foods geared to dogs in certain stages of life, such as puppies versus mature seniors. 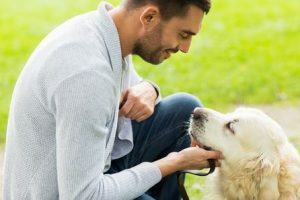 It’s important that a dog owner feeds their pet “the right kind of food” that will ultimately help them overcome any problems with chewing or digestion. It’s also important to not overfeed a dog because then they become obese, which tends to lead to several health problems in the long term, such as heart disease. With regards to water intake, dogs need clean, fresh water daily. In general, it’s a good idea to fill the water bowl at least twice daily. Just like humans, dogs need to keep hydrated. Another basic necessity for pets is having safe shelter. Dogs cannot easily survive out in nature, unprotected from the elements and harsh temperature changes. Therefore, it’s vital that owners make sure they’re indoors when bad weather hits, and that they’re sheltered from harm at all times. If and when that involves caging them (for their own safety, especially), so be it. Going to the bathroom is another key element of keeping your pet healthy. They may need to learn to use “doggy doors” or potty pads. Generally, they need to learn to show their owners they need to be relieved so the owners take them outside to relieve themselves. Their “bathroom” needs to be clean since proper hygiene and sanitation is good for their health. Finally, dogs require regular doctor visits and grooming times. Vets and groomers work in tandem to ensure pet dogs are looking, feeling and acting their best. Consider them allies in your ability to raise and keep your pet safe and healthy over the long term. Groomers have the means to bathe, brush and trim dogs, as needed, while also doing flea and tick removal. D’Tails Grooming of Augusta, Georgia, can groom your dog— call 706-731-0089 for more information.